Jim and I had overnight guests Wednesday night. It was a short and simple hosting stint as we were merely the midway stopping point for extended relatives going from here to there. Nothing draining, as guests—even the most beloved, most welcomed—can often be. 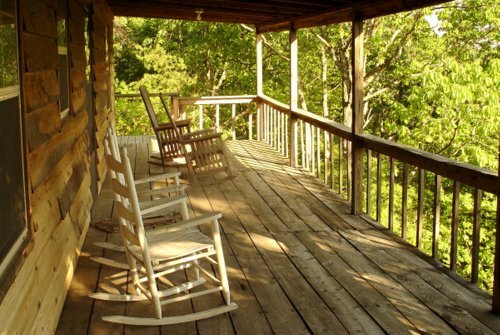 Once our guests left and the house was empty, though, I wanted nothing more than to grab my cup of coffee and sit out on the back deck in my rocking chair. So I did. I rocked and rocked while listening to the birds chirp and the waterfall gurgle. The dogs investigated the far reaches of the yard, and the cats sat inside at the window, wishing I'd let them out to join us. The breeze blew gently, the temperature grow warmer, my coffee grew colder. Outside, plants needed watering, flowers needed deadheading. Inside, email needed to be answered, a post needed to be written. But all I wanted to was rock. And rock...and rock...and rock. As I sat there rocking, I realized rocking is something I never tire of. It's one of the very few things I never tire of, may possibly be the only thing I never tire of. I love spending time with my husband, my family, my friends, and, without a doubt, my grandkids. Extended time with even those I love the very most, though, can be draining, tiring. I'm an introvert at heart, I get my energy from time alone. Yet even those things I do alone, my solitary pastimes I enjoy pursuing solo, aren't activities I can do without end. I tire of baking, being on the computer, of reading, of writing, of listening to music, of trying to play music. I can only walk for so long, take photos for so long, sit and do nothing for so long, without tiring of whatever it is I am—or am not—doing. I have rocking chairs of various sorts inside my house, outside my house. There's a wooden rocker in the upper-level porch and one in the spare bedroom. A glider/rocker sits in the living room, another in the family room. I have a wooden rocker on the deck, a rocker-like swing in the back yard. All awaiting me, all ready to be set into motion. The back and forth...back and forth...back and forth of those rockers fit whatever my mood, beat in time with whatever my heart rate. Rocking calms me when I'm riled, soothes me when I'm sad, helps me burn off energy when I'm tense, excited, nervous, angry, exhultant, worried. I find peace in rocking. I never grow tired of rocking. What do you never tire of?